The unmistakable opening guitar chords of “Radar Love” exploded the silence as Nova Blu and I stood poised, center field, at the 2012 USDDN Disc Dog World Finals Championship. Whimpering with excitement and anticipation of my cue to begin, his crystal blue eyes were intensely fixated on the stack of discs in my hand. Five years earlier it was those same blue eyes that had saved his life. Returning home down a barren stretch of black highway with Chinese takeout for their late night dinner, a fellow disc dog friend noticed something in the road reflecting the lights of her cars and she passed. It looked like two eyes. She slowed down and turned the car around heading back to where she saw the eyes. It was a puppy, slumped over and quivering in the middle of the road, obviously petrified by the crashing thunder and cars racing by. Quickly parking her car, my friend sprinted over and scooped up the wet ball of fur into her arms and gently placed him on the front leather seat of her car. Once home, she and her husband checked the puppy out for injuries and miraculously none were found. It was a young male and one very lucky dog. I was helping out at a disc dog event a few days later and my friends had brought their new rescue along with them. Being successful disc dog competitors, and already having several dogs, they were needing to find this little guy a home and asked me if I would like to adopt him. 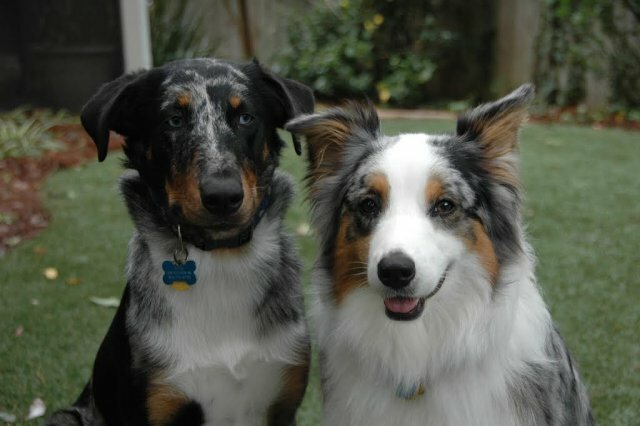 I wasn’t planning on getting another dog, already having my hands full with Valkyrie, my Australian Shepherd, who seemed to think she was the center of the universe. But, by the end of the day, my heart was won over and I rationalized that Valkyrie could benefit from a playmate. I journeyed home that day with a big surprise for my husband, Charlie, and a commitment to provide a forever home to this wayward soul. We named him “Nova Blu”. “Nova” after the brand name of a popular disc and “Blu” for his mesmerizing eyes and what our friends had called him the day they rescued him from the highway. Our veterinarian said he was about three months old and looked like a mix of Catahoula Leopard Dog and Border Collie. With floppy ears and a gorgeous blue merle coat of black, gray and brown, he looked like Valkyrie’s baby brother who had similar markings. It was a match made in heaven; for Valkyrie, Charlie and me. Nova Blu turned out to be a very high energy dog and caught on to catching discs immediately. It became his passion, begging relentlessly, and sometimes obnoxiously, to play every minute of the day. With an unstoppable prey drive, and the speed of a locomotive, he had found his calling and loved every minute of it. Throwing discs with him was quite challenging in the beginning, especially when it came to his concentration skills, as he found it more enjoyable to keep running away when he caught one rather than bringing it back to me. But with time, patience, understanding and tons of practice we began working together as a team and eventually competed in disc dog competitions throughout the southeast. It provided us with time to play, time to work and, more importantly, time to bond. We never won first place in any competitions but did rank high enough to qualify and compete in the USDDN Disc Dog World Finals Championship in 2010 and 2012. I can no longer compete because of knee challenges but Nova Blu gets his disc fix daily with me throwing to him in our back yard or nearby field as Valkyrie, the diva, prefers luxuriating in the sun instead of working up a sweat. Nova Blu was given a second chance and became a loyal member of our family. And he was also given a job. Dogs with high drive need an outlet to put their energies into. Ideally this would be something positive, such as disc, ball or water sports, rather than disruptive or desructive behaviors in the home. Too many dogs end up in the shelters because their caretakers did not provide them with the unerstanding and exercise they really needed. Nova Blu is still an anxious dog and petrified by thunder, trembling violently and hiding in the shower when a storm arrives but we are patient, knowing it will pass. When you make the important decision to bring a dog or cat into your family, choose a rescue from your local shelter or foster group. Like Nova Blu, they are a survivor. In providing them with the proper care, exercise and love they will become a devoted member of your family and you both will receive what is well deserved. Christine is a former disc dog competitor, continuing to be involved in fun activies with her Catahoula/Border Collie mix and Austrailian Shepherd on a daily basis. She is also caretaker to a colony of ferals cats, an advocate of TNR and a member of the Cat Writer's Association.